- New: Bitcoin accepted! It is now possible to donate using Bitcoin ;) the open-source p2p electronic money available worldwide! - Fixed: important issue in cache management of hidden variants and current variants: were cached using the very same data. - Fixed: some NaviFirm+ settings were lost after an automatic update. - Fixed: the welcome box containing the recent changes was not showed after an automatic update. - New: interrupted and incomplete downloads can be resumed, avoiding to download the whole file again! - Improved: if, for any reason, some firmware file is invalid, it will be automatically reported to NaviFirm+ server and it will be fixed asap. - Improved: handling of server error messages sent to the client has been rewritten. - Fixed: some panels sizes, were not restored properly on launch. - Fixed: changed the default value to optional = false during the vpl parsing. - Fixed: in a very particular case, the product list was empty. - Fixed: double-click on download window to open the destination path was not working properly when clicking on labels. - New: Variants that (for any reason) have been replace/removed/hidden from Nokia Care Suite server, will be shown by NaviFirm+ in RED colour. You can change this behaviour by manually editing the Config_v2.xml file and set ShowHiddenVariants to False. - Improved: it is possible to donate using Credit Card or Skrill/MoneyBookers. These donations are accepted worldwide, also from counties not supported by PayPal. - Fixed: sometimes users received the message "invalid username or password"
- Known Issues: doesn't support proxy. Proxy support will be added in next releases. New: you can now report missing Product Code, by uploading a .txt list of product codes to the server, so the missing Product Codes will be added to the database. 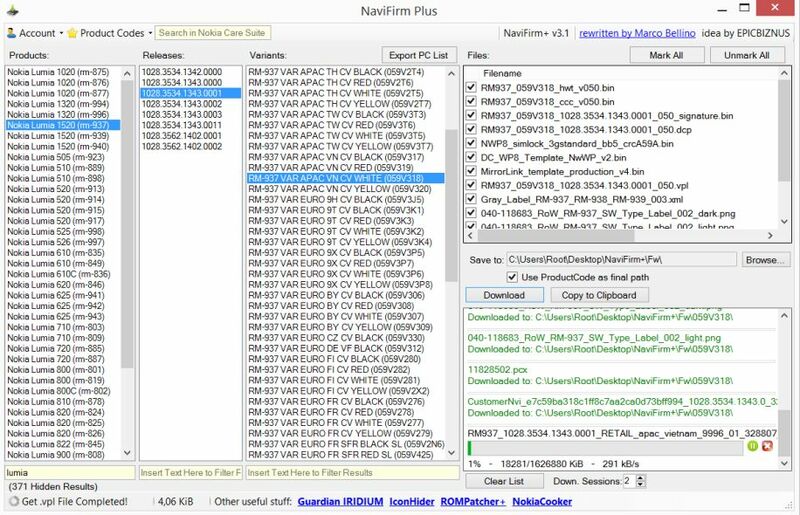 "Product Codes > Upload New Product Codes to NaviFirm+"
- Fixed: all the datetime fields are now saved as UTC format, fixing some cache handling issues. - New: Shows additional Product informations in the tooltip, including phone's image. - New: it is now possibile to Download up to 20 files simultaneously. You just need to increase the Download Sessions limit (default value is 2). - Fixed: crash on Windows 7. 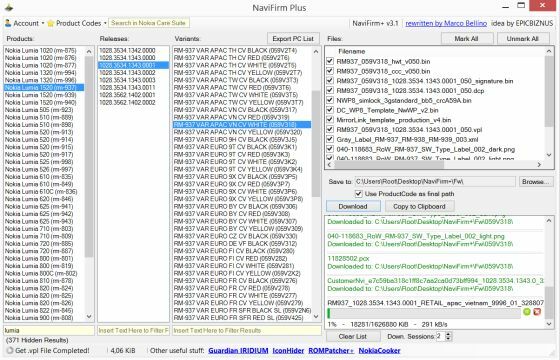 If you don't know how to install, or how to use it, probably you don't need NaviFirm at all.